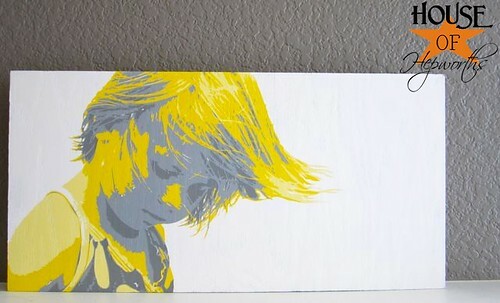 A year and a half ago I partnered with Modern Bird Studios to create a custom piece of art. 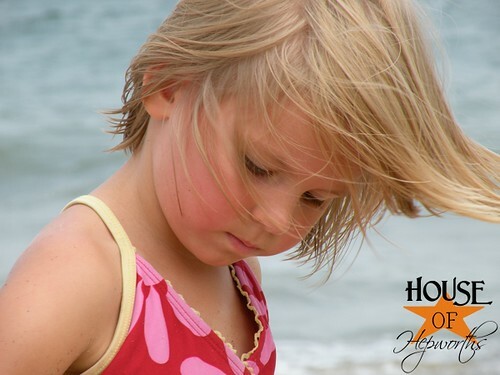 After sending a photo I took of my daughter at the beach, they sent me the most beautiful custom artwork. Apparently it was one of Modern Bird’s most favorite pieces as well! When The View (yes, the TV show!) 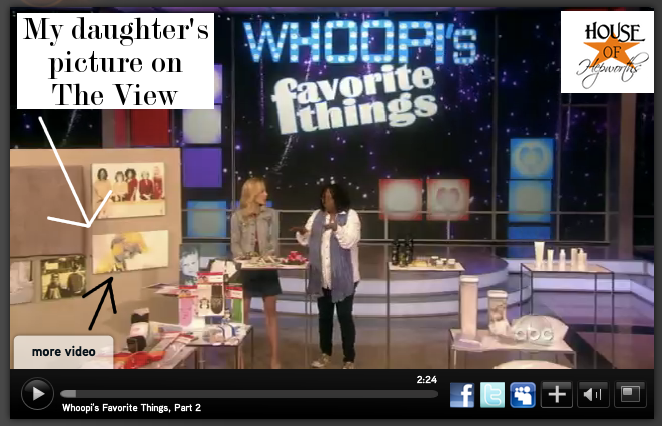 contacted Modern Bird Studios to showcase their art on the Whoopi’s Favorite Things show, they wanted to share the painting of my daughter. Holy cow, my daughter’s face is Right.There.! Whoopi and Elizabeth are just steps away from my daughter’s face. Pinch Me! Oh no she didn’t! 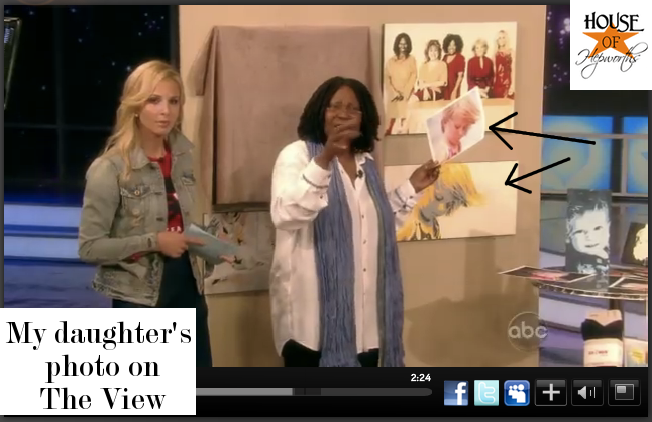 Whoopi is holding the actual photo of my daughter that I took on the New Jersey shore almost 4 years ago. Holy crap! The camera actually zoomed in on my baby! My baby’s face is on National Television! This blows my mind. 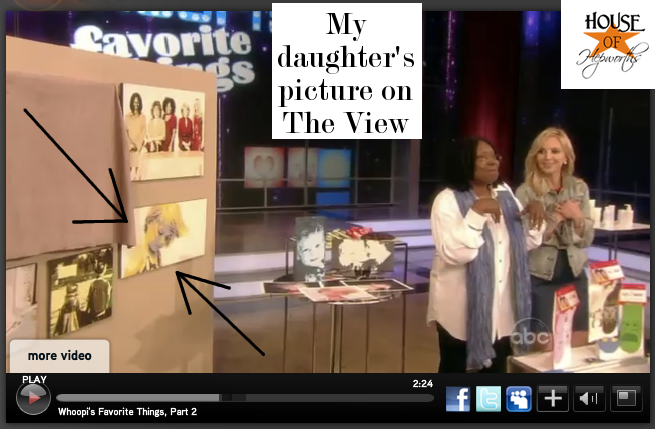 I don’t even believe that they are showing my daughter and my photography on The View. And isn’t the custom artwork just so amazing?! I love how it turned out. Too bad my daughter didn’t get any name-drops or credit though. She’s just a cute face. But it’s still exciting none-the-less. Here is the actual photo I took. I remember that day I was pretending to be a Professional Photographer. I think I did a pretty good job. This photo is 100% unedited. This little cutie-patootie is now graduating from 2nd grade and turning 8 in a few weeks. How time flies! Watch the actual clip here. 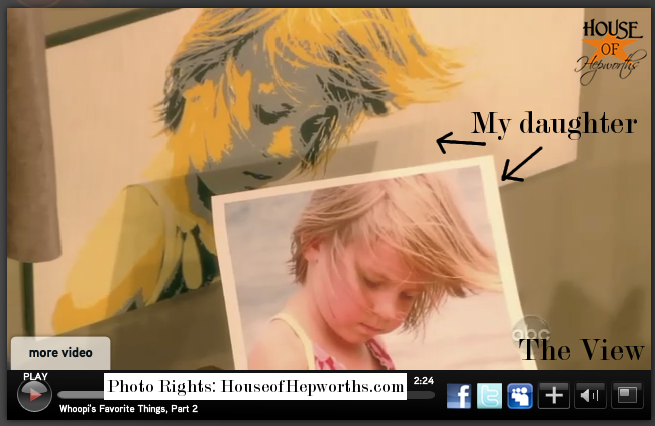 If you’d like to help my daughter and I receive our 15 minutes of fame, you can bombard The View’s Facebook Fan Page with mentions of @House of Hepworths. They deleted my comment! How rude! Just because I’m an amature photographer doesn’t mean I shouldn’t get the credit I deserve for taking that photo that turned into art worthy of The View. 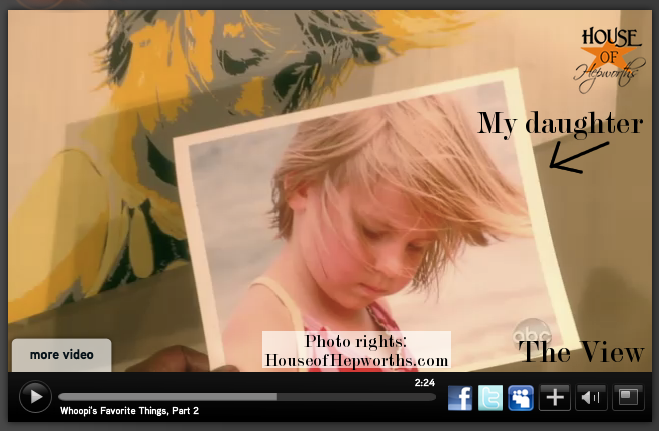 I still can’t believe a photo of my daughter was on a national television show. Such a weird feeling. It still hasn’t sunk in. Thanks for being great fans and readers! I think you guys are seriously the most loyal fans any blogger could ever wish for. I love you all! how rude that they deleted your comment! you know you rock, right? Allison, that is awesome!! You took such a beautiful picture of your daughter!! Yea!! for the 15 min. of fame!! You deserve it!! Love that picture! (both the original and the art!) I tagged ya on a post on their wall….we’ll see how long it stays up! How fun! So excited for you, Allison. I left a little note on their Facebook page 😉 We’ll see if they delete it! 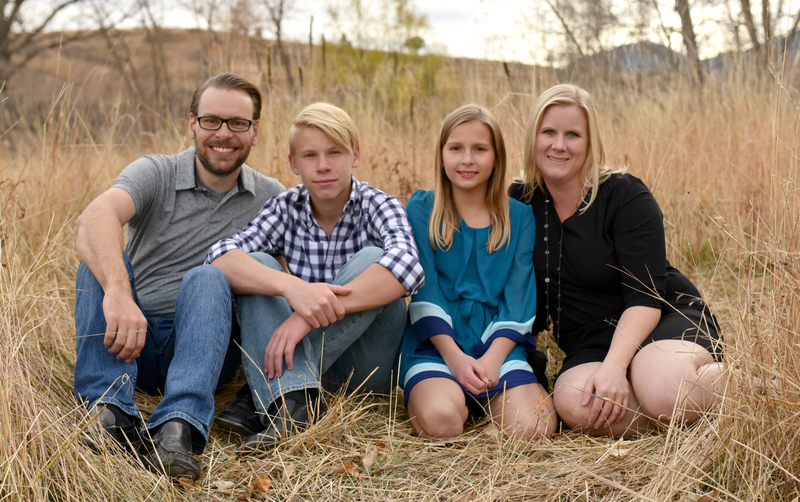 Nice job on the photo! That is so exciting for you! Love the original picture and the artwork is absolutely beautiful! That is awesome. They let you know before hand right? You weren’t just sitting there minding your own business when suddenly you spotted your daughters face on tv? Wow! How exciting! Your photography is great and that is an awesome piece of artwork. I can see why they picked it especially with such a cute subject! 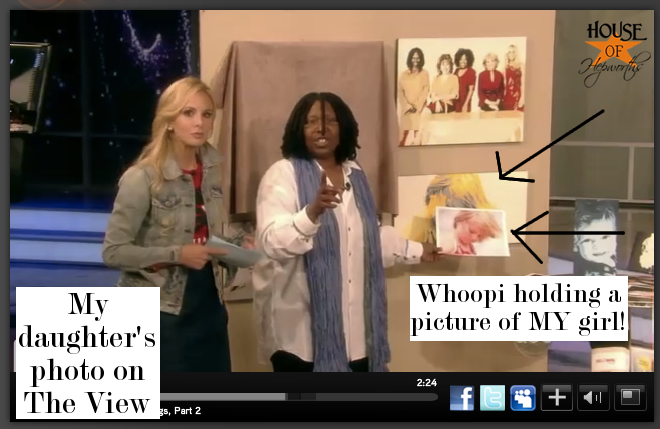 Whoopie with Whoopi! So cool! Where on the Jersey shore by the way – it’s my stomping grounds! I’m just now seeing this post! That is So awesome! What a cool 15 minutes of fame story. What a beautiful photo of your daughter.